(Phys.org) —Researchers from the U.S. Department of Energy's (DOE) SLAC National Accelerator Laboratory and Stanford University have designed a low-cost, long-life battery that could enable solar and wind energy to become major suppliers to the electrical grid. "For solar and wind power to be used in a significant way, we need a battery made of economical materials that are easy to scale and still efficient," said Yi Cui, a Stanford associate professor of materials science and engineering and a member of the Stanford Institute for Materials and Energy Sciences, a SLAC/Stanford joint institute. "We believe our new battery may be the best yet designed to regulate the natural fluctuations of these alternative energies." Cui and colleagues report their research results, some of the earliest supported by the DOE's new Joint Center for Energy Storage Research battery hub, in the May issue of Energy & Environmental Science. Currently the electrical grid cannot tolerate large and sudden power fluctuations caused by wide swings in sunlight and wind. As solar and wind's combined contributions to an electrical grid approach 20 percent, energy storage systems must be available to smooth out the peaks and valleys of this "intermittent" power – storing excess energy and discharging when input drops. 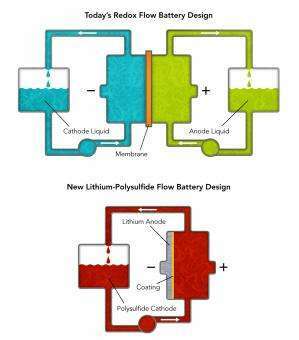 Today's flow batteries pump two different liquids through an interaction chamber where dissolved molecules undergo chemical reactions that store or give up energy. The chamber contains a membrane that only allows ions not involved in reactions to pass between the liquids while keeping the active ions physically separated. 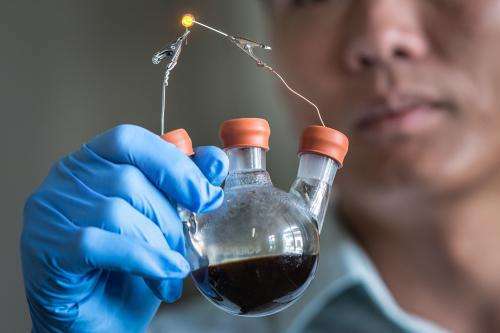 This battery design has two major drawbacks: the high cost of liquids containing rare materials such as vanadium – especially in the huge quantities needed for grid storage – and the membrane, which is also very expensive and requires frequent maintenance. Is this a new and different update to his last announcement? I believe they were doing pretty much the same thing last time we talked and claiming 40,000 cycles? New batteries can power anything. Embrace OpenID. PhysOrg ranks highly enough on Google News to warrant it. Wonder how toxic they are. Usually light elements (lithium 3, sulphur 16) are the least toxic. You can drink oil or breath methane, if you prefer. Dr.Frankenstein used a similar apparatus to the one in the photo- you know what bolts of lightning hitting a kite could do to his castle's electrical grid. A lemon and a potato can light a LED too!! There is not much about the technical thing on the battery. The metal itself is highly corrosive (so better not touch) and flammable. If it comes into contact with water it emits hydrogen and a caustic agent (so better not breathe). Lithium is found in the body of any organisms. However, it doesn't seem to serve any function (you can survive fine without it). Taking some simple precautions it's relatively harmless and simple to handle in technical systems. The ecological dangers of such a system leaking (soil contamination, groundwater contamination) aren't as severe as one might think. 1/Every..including infants... 5000 in U.S is a New Graduate Student from abroad for this new year. Most of the wind/solar systems I have seen charge battery banks and use an inverter to produce ac current. most do not dump energy directly to the grid, so where are the so-called peaks and valleys coming from anyhow? We need to be using all the tech now and stop waiting for better tech. who could afford to wait for new more efficient devices? they could be incorporated when invented. Just like cars that are produced every year with better features, the old ones are still being driven daily. Pass me a steaming cup of HCN, please! Wouldn't you prefer some Plutonium?